Special Thanks to NYU Steinhardt for creating this resource for parents/caregivers to use as a quick guide when preparing for their child's first SLP visit. 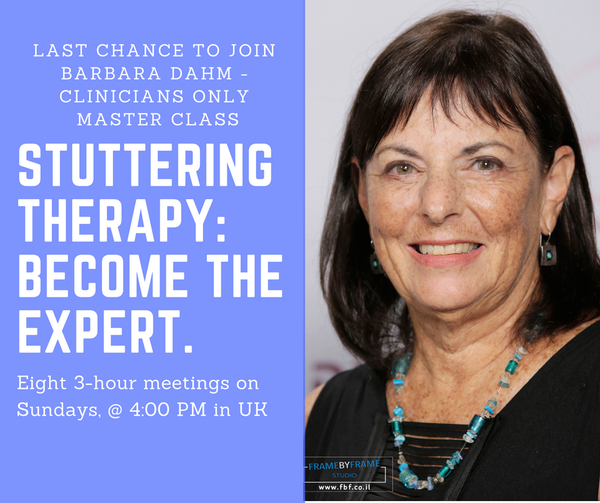 Barbara Dahm, director of Stuttering Online Therapy, developed Dynamic Stuttering Therapy, a revolutionary and life-changing treatment approach for stuttering that has been clinically shown to lead directly to normally fluent speech. Thousands of people around the world have said that this is the most logical, practical and effective treatment for stuttering that they have experienced. She graciously provided a special video dedicated to Future SLPs. There is a SPECIAL bonus for the FutureSLPs.com website visitors! If you fill in the details to sign up for the Clinician Master Class on June 3rd, you will receive a great bonus - Freeing Your Inner Fluency e-book by Barbara Dahm. The bonus will be available to those who sign up here for the course! Note: I will earn an affiliate commission if you sign up for Barbara's master class. I wanted to share this article that Euphony wrote because as a future SLP you may have clients on your caseload that are using Augmentative and Alternative Communication (AAC). Generalization and carryover of learned skills is so important and this article provided a good overview of different ways to effectively utilize AAC. Today assistive communication applications extend well beyond clinical environments. They promote communication and grant SLPs, educators and caregivers with real-life solutions to support language development in real-life scenarios. No one argues the value of assistive communication applications. However, there’s a high-degree of variability across the spectrum of applications and how they’re used that limits the value they provide. 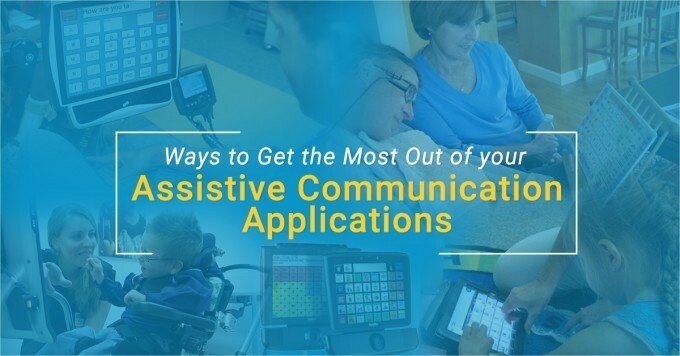 The following dives into four important considerations to take into account when using assistive communication applications in order to maximize their impact and get the most out of them. Many assistive communication applications today rely heavily upon text-to-speech functionality. Sometimes the audio used is pre-stored or “banked” whereas other times it is created dynamically on the fly with synthetic voices. In either case it’s imperative the applications are configured to support interactive communication which allows users to realize their potential as communicators. For most this means SNUG or spontaneous novel utterance generation. SNUG allows individuals to say anything they want at any time. It is based on access to individual words, word combinations, and commonly used phrases of language. Experts contend, assistive communication applications that are not configured to satisfy SNUG compromise human communicative potential and growth. Learning to say and combine individual words along with learning how to use word endings (i.e., such as ‘+s’ and ‘+ed’) enables users to go well-beyond pre-programmed phrases and sentences. It allows them to learn language and gives them the tools necessary to expand upon their communication skills as they go. Once our assistive communication applications have been configured to foster language development, we then should use them under real-life scenarios. Nearly all SLPs and assistive technology professionals agree, the best teaching moments occur during real-life, meaningful activities that encourage the use of communication symbols to participate. For instance, meaningful activities include playing games, preparing food, eating meals, shopping, etc. Using communication applications to interact during these types of activities is particularly impactful. This is because they occur naturally and within everyday contexts that have reinforcing effects. Additionally, it’s important to always respond naturally when your child or student communicates using their device. For instance, if they say “game”, take out a game to play. If they “on” when the lights are off, turn the lights on. If you’re able to respond to their communication in legitimate ways, they will experience the impacts and results words can have. Maintaining natural exchanges through assistive communication applications is paramount. Not only is it important for exchanges to occur in natural contexts, it is also important for assistive communication applications to use voice outputs that sound natural. The quality and authenticity of voice outputs makes a tremendous impact upon trying to facilitate meaningful communication exchanges. Unfortunately today, many assistive communication applications use voice outputs that are robotic and unnatural sounding. There’s no emotion behind them. This makes it nearly impossible for a user to express their mood and frame of mind. As a result, inauthentic voice outputs significantly hamper understanding and limit the impact of communication exchanges (note: our new software product addresses this). Therefore, before selecting an assistive communication application, be sure to request voice samples from vendors to ensure the voice outputs are authentic and natural sounding. Once acclimated with a particular application, pay close attention to the words that seem most important to your child or student. These initial words will give you a baseline to measure against as they progress. To do this effectively, introduce the application’s vocabulary in small, measured steps. Keep these initial exchanges fun and flexible. As you progress, build upon their successes and take note of the words they retain and continue to use as they advance. When it comes to assistive communication applications, the ways they are used can make all the difference. SLPs, educators and caregivers can extend their value by using applications that are positioned to support language development. Additionally, upon identifying what motivates your child or student, the assistive communication applications you use should employ communication skills which correspond to real-life activities. And as assistive communication applications continue to evolve and improve (e.g., text-to-speech voices that are authentic and fueled with emotion), SLPs, educators and caregivers will have more flexibility, and thus, more opportunities to extend their overall impact.